This installment of the Lost Lore-series clocks in at 10 pages, 1 page front cover, 1 page editorial, 1 page of SRD, leaving us with 7 pages of content, so let’s take a look! 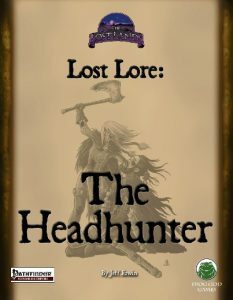 The headhunter as depicted herein is a 10-level prestige class that grants 3/4 BAB-progression, 1/2 Fort- and Will-save progressions, d10 HD, 4 + Int skills per level and can be qualified for at 5th level. The first important aspect here pertains the fact that carrying carrion heads around does not really always go over well – a sidebar deals with the cultural implications and what happens when you e.g. carry a foe’s head to a creature. After severing a defeated foe’s head, the headhunter may select one of the creature’s class or special abilities, extraordinary or supernatural abilities, feats (regardless of prerequisites), but sans spells “growth points” or abilities that summon creatures. This ability may be used once as a standard action and if an ability has an indefinite duration, it instead lasts character level rounds. A total of 1/2 class level (minimum 1) heads may be carried around. Weird – the ability suddenly mentions a Craft (taxidermy) check, when no such check was rolled upon harvesting the head, making me thing that something went wrong here – the ability should specify making the roll not only in the example, but also in the ability itself before suddenly mentioning it. 2nd level nets Cha-mod times /day gentle repose. 6th level unlocks ant haul as an SP. Starting at 3rd level and every other level thereafter, the PrC may take a headhunter secret – these include a +1 bonus to Intimidate checks per head carried. Others unlock undead heads as viable targets or the option to make use of spells or SPs as if a scroll or use it in conjunction with spontaneous are prepared spellcasting, which can be pretty powerful. Using the head as a bane weapon versus the social group associated (table by size included) or gain a severed head familiar. Weird: The class is generally spell-progression-less, but mentions the head acting as a familiar sans specifying the familiar-progression. Also odd: Formatting is different for that secret when compared to the others. The head is created by applying a template included in the pdf (including sample head). Head-weights are btw. provided. At 4th level, the headhunter may carve (with another Craft-skill) primitive bone rings that grant CR temporary hit points to the wearer. 8th level nets the ability to make skull masks that duplicate skull masks. As a capstone, the Craft (taxidermy)-result no longer depicts the number of days a given head lasts. At 10th level, the headhunter may share the benefits of heads with allies via skull cups. Really odd – the class features a total of 7 abilities that I *think* are headhunter secrets – oddly, though, they have a different formatting than the first secrets provided. These include transferring heads to animal companions or cohorts and another one has a bardic performance granted per head. Also odd: A secret that allows the headhunter to use a “Skill as if it was a class or racial ability” – what is this supposed to mean? Oh, and one secret makes heads last as long as they do by the base ability, longer when kept dry and vermin-free, making the secret useless at 10th level. The pdf also features archetypes: The face-marking warrior is broken as hell: “When a barbarian would normally gain a rage power, he may instead select the abilities of a foe slain within the last year that does not require an action to activate and gains the ability during rage.” ARGH. This is so horribly broken, I’m not going to dignify the archetype with anything else. Broken. Next. The Head-taker archetype replaces the 2nd level bonus feat with the option to incur a -4 penalty to atk and incur an AoO to perform an attack that deals 1d4 rounds of sickening; on a crit, the ability also deals 1d6 points of damage to ALL mental attributes AND staggers the foes. WTF. Next. The Mystery of the Head’s revelation has some abilities that could use an activation action, but also has the extremely evocative trick of removing a victim’s head, keeping the head alive…which is pretty awesome. Also cool: The capstone lets you take off your head! Yes, this, while having only limited use as a player, is a cool ability to scavenge. The head-shrinker shaman can use shrunken heads to counterspell, with the slain foe’s CR acting as caster level for the dispel attempt and gains a severed head familiar. Torques of Blade Turning prevent decapitation and head-severing effects…but does that extend to granting immunity to vorpal weapons? No idea. Editing and formatting are uncharacteristically jumbled for Frog God Games – there seems to be something seriously wrong with the head hunters formatting, to the point where it impedes the functionality of the PrC. Layout adheres to FGG’s two-column full-color standard and the pdf has a neat b/w-art. The pdf has no bookmarks, but needs none at this length. Jeff Erwin’s headhunter, alas, is a mess. In case you haven’t noticed – the PrC and the mechanics herein are based upon the deeply flawed called shots system, but lack the mechanical precision and scope to make the content really work. The material isn’t horrible and in fact, very flavorful, but it is all over the place. Synergy with classes exceedingly unlikely to take the PrC (per se nice, but only when the bases are all covered! ), internal balance between secrets all over the place, flawed formatting, confused presentation. And then there would be the fact that, beyond the called shot-based issue, the pdf also falls on its face regarding the balancing and proper codification of abilities stolen from vanquished foes; one-use makes them potentially OP and the pdf fails to specify how that works with feats. Additionally, the sheer wide-open nature sans detailed notes of codifying abilities render this wide open to PGing and GM ruling. This does not mean that it doesn’t work – it just means that it doesn’t work even near the level of precision I expect from a crunch-supplement, no matter how flavorful and cool the abilities are. It is the ambition and flavor of these abilities and the scavenging potential are the saving graces of this pdf. My final verdict clocks in at 2 stars. You can get this pdf here on OBS and here on tabletoplibrary!